I wrote this article back in the late 90s, or early 2000s during one of my “lean out” periods. I’ll leave the article as it was written, and I may make annotations to reflect current science. Losing body fat is not such a complicated task. Actually it’s rather simple process. Notice I said “not complicated,” but I didn’t say it was easy. There are a few surefire ways to increase your metabolism, and shift the body fat burning process into overdrive. Below I will provide a brief description of the 3 essential steps required in order to successfully deplete the body of unwanted fat storage. What makes me qualified? Experience. I have been playing this game for some time, and I tell you the truth, even though I have been successful I am still learning. The steps below are the basics, I guarantee if you follow these steps within 3 months you will be amazed at your progress. On the other hand, I guarantee you if you don’t follow these basic steps, you will be one of the people at the gym that trains for years, and looks the same. You may lose weight, but it always comes back, if you originally looked like an apple, you will look like a smaller apple, but still an apple nonetheless. How’s that for words of motivation? The first step, eat smaller healthier meals. Now I’m talking to you from solid experience in this particular step. I have tried every diet out there short of starvation. FAD DIETS DO NOT WORK!!! Trust me on that one. I won’t waste yours or mine time explaining other diets, and why they do, and don’t work, if you’d like that information you may go to the library or web and research. 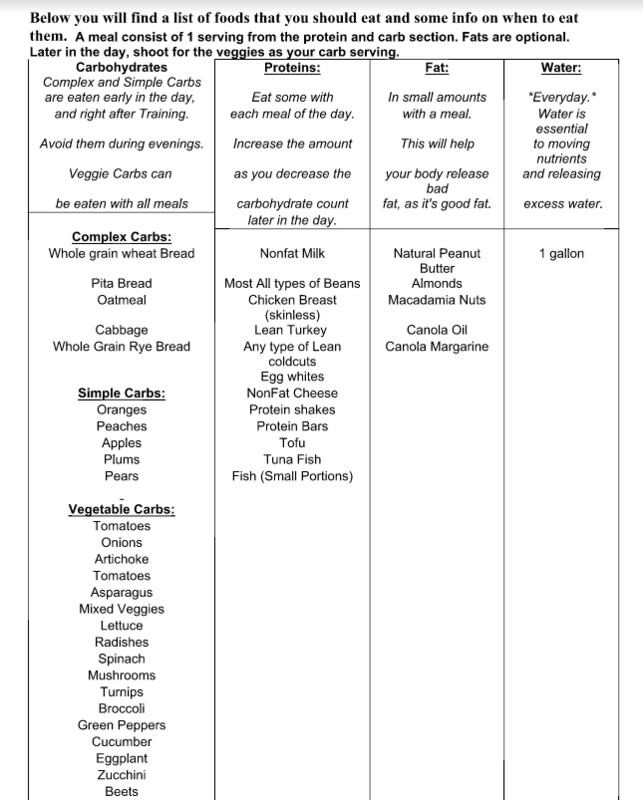 The method that I’ve been applying, and has worked very well for me, is the balanced diet approach. What is the balanced diet approach? Well simple, a serving of protein, a serving of carbohydrates, and vegetables as desired. Notice I didn’t say a serving of fat, this is because the food we generally eat has its own body fat, IE: chicken breast, turkey, tuna, etc. Carbs should be complex, and the portion kept small, the protein should be the bulk of your meals. The second step is Cardio. Cardio is important because it burns a huge amount of calories in a shorter period of time. For example I can burn about 800 calories in 35 minutes or so depending on my intensity. You cannot burn that high number of calories any other way but through cardio. Later I’ll explain other ways to burn calories and fat but for now let it suffice that cardio is the best way to kill the most amount of calories in the lesser amount of time. I prefer the elliptical crosstrainer machines. Though you may jog or take a step or spin class or whatever tickles your pickle. Third I state to perform resistance exercise. The reason being is that by performing resistance exercise you build more muscle, thus require more energy to support this muscle, thus burning more body fat.. Strength training gives you long term fat burning. Unlike cardio you don’t burn it all during the time you are lifting weights. However that muscle you build will now serve as a slower more long term fat burning element. Girls you won’t get buffed like Arnold or look unfeminine if you lift weights.. Don’t worry about that.. Believe me, building muscle is not that easy, even for a guy with plenty of testosterone.. In a nutshell those are the basic elements of dieting for the summer, a wedding, a party, whatever.. These are the basics. There are more elements such as supplements that may help, but for your purposes here they are irrelevant. Why am I always struggling at the gym?